I remember the first time I saw this, it was in the Hyland Theater in Kingston, which is now known as Stages Nightclub (sigh). My father took us to see it, but he obviously didn’t get it, cause he fell asleep during the film’s run time. But I loved it. I was intrigued by video games, the idea of computers in general and it was a Disney movie. All wins as far as I was concerned. And now, decades later, I’m happily pulling my blu-ray copy out to rewatch it for the 101 Sc-Fi Movies. In a lot of ways, Tron is a novelty piece now, it showed the blossoming of computer generated effects, and the Academy refused to nominate them for the visual effects award because they thought using a computer was cheating (oh how times have changed!). It has a very basic story, but for me and a lot of others in my generation, it’s not only remembered fondly but passionately. Flynn (Jeff Bridges) is a former computer wizard for Encom. He got screwed out of his job, and his game creations by an older and sneakier Ed Dillinger (David Warner) who is now one of the senior execs, who along with his Master Control Program (voiced by Warner) are acquiring programs left and right, and not always legaly. The two of them put a lockdown on the company when the MCP realizes that Flynn has been sneaking around in the cyberspace of the company through his avatar CLU (Bridges). This put Alan Bradley’s (Bruce Boxleitner) Tron (also Boxleitner) program on hold, as it’s designed to watchdog the MCP. Alan and his girlfriend, Lora (Cindy Morgan), Flynn’s ex, help sneak Flynn into Encom to Lora’s laser bay terminal so he can find his game files, and prove he owns them, from the inside. The MCP realizing Flynn is there, digitizes him with the laser, and funnels him into the world of the computer (which was film in black and white, and then colored in post). Neon coloring, and computer images take over (though by today’s standards they are kind of simple), as Flynn is forced to play gladitorial games to survive (making firsbees cool in my book), and eventually escape, in those still-incredibly-cool light cycles. He is accompanied by Tron and Ram (Dan Shor) as they race to make it to an I/O tower to communicate with the real world. They are threatened not only by the MCP, but by its menacing henchman, Sark (Warner again! ), and are chased by recognizers, hooded soldiers, until finally, Tron, Flynn and Yori (Morgan) take on the MCP face to face. The story is simple, the designs are definitely dated, but the film is still infused with an manner of cool that if you didn’t see it growing up, you won’t get it now. That’s kind of harsh, but it captured the minds of a lot of my friends, and myself, I remember playing Tron on the street with my friend Sean as we would whip a ball at one another, and if you missed it, you lost one of the rings around you, which you had to remember to jump over now that it was gone, or you’d lose. Lose all your rings, you lost the game. So watching this movie is not only a viewing experience for me, it’s a recall of my entire youth from 1982 on. This movie will always have a spot in my heart. Did you see it in ’82? I love this movie, I loved it then, and I love it now. It helped spark a lifelong fascination with computers. 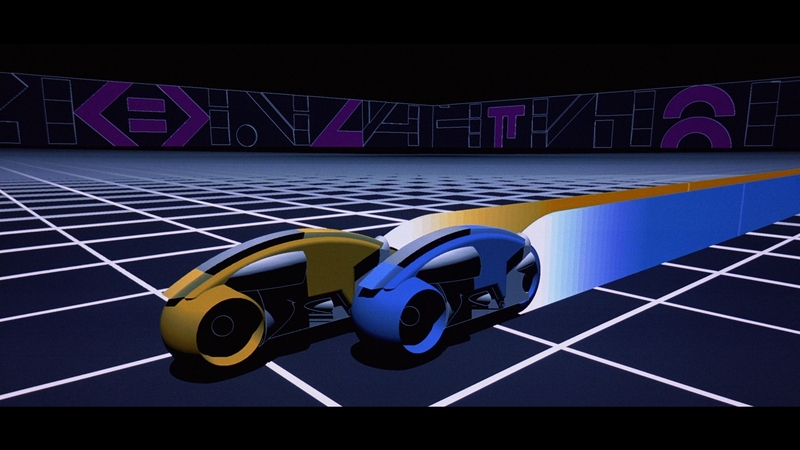 This movie is a perfect example of how superior design can trump technology, The visuals in Tron look a bit dated, but they look stylish and appropriate. Like the visuals in the 50’s version of War of the Worlds, they rely on design and their stylised elements will stand the test of time. In a way its like the video games of the time that inspired Tron..the simple, well executed graphics served the story of the games, and did not get in the way. So games like PacMan are still playable and entertaining, Whereas many of the technically superior games today exist solely as demonstrations of technology. Once the technology is obsolete, they lose their playability. 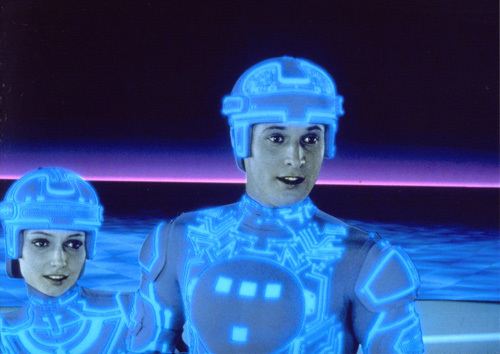 The original Tron is like this..it looks good. Dated, maybe a bit goofy, but the dated effects don’t distract because the design and art direction serve the story. The new Tron Movie is a bit of a CGI-gasm.The effects are lush and technically superior, but I do not think they are as well executed. the story seems as a platform for the effects, not the other way around. The Clu character suffers from the uncanny valley and will look dreadful in 10 years as technology advances.The movie wont be as watchable.